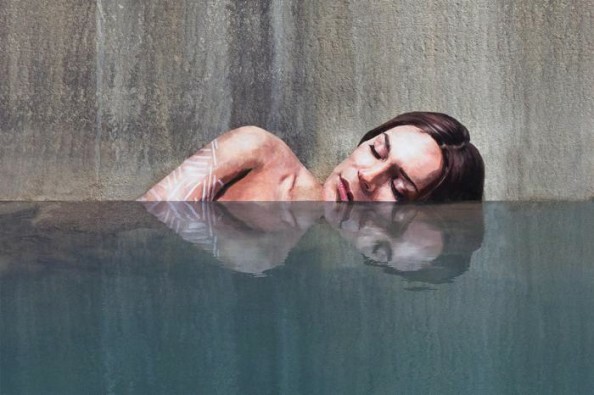 Straight from the Aloha State, Sean Yoro is an Hawaiian grown artist who not only creates amazing murals but he does it while standing on a surfboard. All murals portray women swimming or bathing and they seem amazingly alive due to the reflection they have in real water. Hula now resides in New York City and he picks abandoned places with natural water on the compound, takes his paint, a surfboard and transform it into a beautiful canvas. His approach towards murals got the attention of many street artists and of the entire community. His Hawaiian touch on creating art is fun and difficult at the same time. Painting from water is a challenge since you don’t have below a steady ground. With practice and a natural born talent, his work is simply amazing. All images are made in oil paint and due to the circumstances in which they are produces, it might take up to four days to finish a simple work. All portraits are large, hyperrealistic images of beautiful women partially submerged in water. He keeps an eye open to find new places to draw his murals, he even applied to get permission to create some of his work on bridges. Until he gets it he keep transforming dilapidated constructions into incredible exhibitions. All his art can be admired on his website, created under his stage name Hula. There you can view all his latest work as well as buy some of his art on print. Be fast, his works are selling fast.